Situated at the south-eastern tip of mainland China and in the heart of Asia, Hong Kong enjoys an economic and strategic importance that exceeds its geographical size in an area of only 1,105 square kilometres. With a population of approximately 7.34 million, Hong Kong is a densely populated city, comprising Hong Kong Island, Kowloon Peninsula, and the New Territories. The average population density was 6,780 people per square kilometre (as of 2016). Nonetheless, Hong Kong is also known for its beautiful and well-managed country parks and greens, located mainly in the New Territories and 262 outlying islands. English is the teaching medium at most universities, including CityU, but both Chinese and English are the official languages in Hong Kong. English is widely used within the government and also by the legal, professional and business sectors. There is no shortage of well-educated, competent bilingual or even trilingual professionals who speak English, Cantonese and Putonghua. During the summer months, Hong Kong can get very hot and humid. Most indoor areas are air-conditioned, including campus facilities. Winter temperatures can drop below 10°C (50°F) but as cold spells are usually short, there is practically no central heating. Light clothing such as T-shirts with jeans or skirts is appropriate for the summer while warmer clothing such as sweaters, jackets or coats is required for the winter months. For more information, visit the Hong Kong Observatory or call (852) 187 8200. Tropical storms and typhoons occur mainly between May and November. When there is a heavy rainstorm or typhoon in the vicinity of Hong Kong, the Hong Kong Observatory will issue different signals for weather conditions. The following signals and warnings will be broadcasted on TV, radio and the University’s homepage. For details on the University’s guidelines and arrangements when bad weather warnings are in force, visit https://www.cityu.edu.hk/fmo/awa. A tropical cyclone is approaching Hong Kong, but most activities will be unaffected. A tropical cyclone is close to Hong Kong and may hit the territory directly. All activities including work, school and outdoor activities should cease. People should stay indoors. Heavy rain is expected and will affect some areas. All CityU outdoor activities will be cancelled. Most indoor activities remain unaffected. Intense and heavy rainfall is expected. Activities should cease and people should stay indoors when the warning is announced. Compared to many other places in the world, Hong Kong is clean and safe. No vaccinations or injections are officially required. Nevertheless, people in Hong Kong are vigilant about flu prevention, especially during the peak season for influenza from January to March and July to August every year. For more information, visit the Department of Health website. During flu seasons, don’t be surprised when you see people wearing face masks. They do so to prevent the spread of germs. Tap water in Hong Kong is not fit for drinking. You are advised to drink boiled water or water from drinking water fountains. Bottled mineral or distilled water is available at the food outlets on campus, convenience stores and supermarkets. Smoking is prohibited in most indoor areas, including the CityU campus and Student Residence, malls, restaurants, karaoke lounges and bars and some outdoor areas such as public beaches and swimming pools, transport interchanges and outdoor escalators. Any person who smokes or carries a lighted tobacco product in a statutory no-smoking area commits an offence and is liable on summary conviction to a maximum fine of HK$1,500. For detail, please visit the Tobacco Control Office of the Department of Health. In an effort to keep Hong Kong clean, any person caught littering or spitting faces a fixed penalty of HK$1,500. Armed violence and serious crime rates are comparatively low in Hong Kong. However, it is in your best interests to remain vigilant at all times regarding your personal safety. Petty crimes are common in tourist spots such as Lan Kwai Fong, Wan Chai, Causeway Bay and Mong Kok. Always hang out with people you can trust, especially when clubbing and in bars, and always stay in groups. Beware of pickpockets on public transport, especially the MTR. Coffee shops, student canteens and libraries are also areas in which thefts are common. Do not leave your personal computer, mobile phone or other belongings unattended. To report the loss of identity documents or objects of value to the police, call (852) 2527 7177. Hong Kong has left-hand traffic. Always check on your right-hand side before crossing the road. While waiting for the signals to change before crossing the road, please be patient. Though it may be tempting to cross the road if there is no traffic, it is not worth the risk for a few seconds. The standard electrical voltage in Hong Kong is 220 volts AC, 50 Hz. 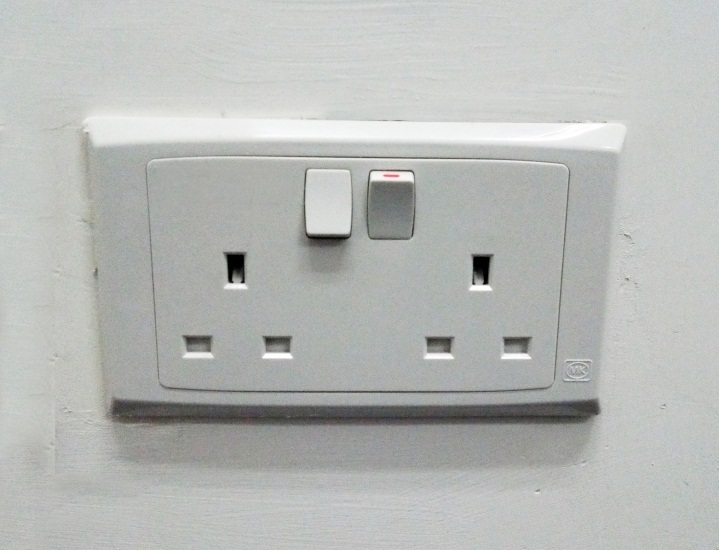 The majority of electrical sockets allow the use of three-pronged plugs. Voltage transformers and adaptors are widely available and can be purchased in most convenience stores, supermarkets and even the canteen at the Student Residence. With a population that is mainly ethnic Chinese and a special historical background, Hong Kong is a global city in which Chinese traditions intertwine harmoniously with Western culture. You will find multiple denominations of churches sharing space with Chinese joss houses, temples, mosques, and synagogues. It is not surprising to see elderly residents playing ancient Chinese board games on digital tablets. In Hong Kong, people celebrate the Christmas and Easter holidays with the same fervour as they enjoy Buddha’s Birthday and Chinese New Year. Hong Kong is also an inclusive and innovative city where state-of-the-art skyscrapers are designed in consultation with Feng Shui masters. In Hong Kong, most of the offices in the financial and commercial sectors are open from 9:00 am to 5:00 pm on weekdays, and from 9:00 am to 1:00 pm on Saturdays (closed on Sundays and public holidays), whereas government and university offices normally adopt a 5-workday weekly schedule. Shops are typically open daily from 10:00 am to 10:00 pm and restaurants will have even longer hours. Bedding, hangers, tableware, personal products, etc. Hong Kong is a multicultural city where people enjoy the freedom to practise their own faiths. Most religions are represented in Hong Kong including Buddhism, Taoism, Confucianism, Christianity, Islam, Hinduism, Sikhism, Judaism and Jainism, etc. It is easy to find temples, monasteries, churches and mosques in Hong Kong. At CityU campus, a quiet room is available (Room 4205, 4/F, Bank of China (Hong Kong) Complex) for quiet reflection, meditation and prayer.